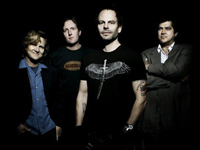 Alternative power popsters Gin Blossoms were formed in 1987 in Tempe, AZ, by longtime friends Bill Leen (bass) and Doug Hopkins (guitar), with an initial lineup also featuring vocalist Jesse Valenzuela, guitarist Richard Taylor, and drummer Chris McCann. The following year saw several personnel shifts as the band struggled to solidify — McCann was replaced by Dan Henzerling and, shortly thereafter, Phillip Rhodes, while Taylor was fired and replaced by guitarist Robin Wilson. Wilson and Valenzuela subsequently switched roles, and the band recorded a self-released album, Dusted, in 1989. A&M signed them the following year. After an impressive 1991 debut EP, Up & Crumbling, the Gin Blossoms rocketed out of the college pop charts and into the mainstream with their 1993 hit single “Hey Jealousy.” Combining the ringing guitar hooks of the Byrds and R.E.M. with a solid, rootsy drive, the band’s breakthrough full-length album, New Miserable Experience (which had actually been released the previous year), was filled with songs equally as strong as “Hey Jealousy,” including the second hit single, “Found Out About You.” New Miserable Experience and its singles dominated radio and MTV for the following year — “Hey Jealousy” and “Found Out About You,” both penned by Hopkins, were in heavy radio rotation nearly a year after their initial release — pushing the sales of their debut album to over one million copies. However, all was not well. Hopkins’ battle with alcoholism and depression had taken its toll on the band during the sessions for New Miserable Experience, and he was fired shortly after the record’s release, with guitarist Scott Johnson taking his place. Speculation abounded as to whether the band would be able to maintain their success without Hopkins’ melancholy songwriting voice. Tragically, on December 5, 1993, Hopkins shot and killed himself, even as the songs he had written were blanketing the airwaves. In the summer of 1995, the Gin Blossoms contributed “‘Till I Hear It from You,” a song they co-wrote with Marshall Crenshaw, to the soundtrack of the film Empire Records. “‘Till I Hear It from You” became a major radio hit, but was never released as an official single until it was the B-side of “Follow You Down,” the first single from the group’s second album, Congratulations…I’m Sorry. Upon its release in February of 1996, Congratulations…I’m Sorry charted well, but within six months, it had disappeared from the charts. Following the supporting tour, the Gin Blossoms disbanded in 1997. Strangely enough, the group reunited sans Rhodes on New Years Eve of 2001 for a concert. Deciding to put themselves back together for a tour, the band hit the road a few months later in the summer of 2002 and released a live DVD that fall to prepare audiences for a new album, Dusted, which was followed four years later with Major Lodge Victory. Major Lodge Victory was released by Hybrid Recordings on August 8, 2006, and “Learning the Hard Way” was the first single. Major Lodge Victory debuted at number 159 on the Billboard 200 album chart. This was the first time the Gin Blossoms had appeared on the Billboard 200 chart in 10 years, one month, and two weeks. Gin Blossoms had last appeared on the chart during the week of July 13, 1996, with their previous album, Congratulations… I’m Sorry. Since reuniting, the band has toured at various locations across the United States. Frontman Robin Wilson is best known for his interaction with the crowd. He often hands off a tamborine to a lucky fan in the front row to strike in sync with the drum beat. He’s also been known to sing directly into fans’ cell phones during some of their more established hits such as “Follow You Down” and “‘Til I Hear It From You”. Often during live performances, Wilson will also introduce the band to the audience. He typically calls himself “Bif Del Monte,” and introduces Jesse Valenzuela as his brother, “Pablo Del Monte.” Former member and co-founder of the band, Doug Hopkins (deceased), was known as “Otis Del Monte,” while bass player Bill Leen is known as “Soup-bone Del Monte,” and drummer Phillip Rhodes as “Guido Del Monte.” These nicknames came from the band’s early days playing at local bars around their hometown of Tempe, Arizona. As the story goes, one night the band was set to perform a gig at Long Wong’s, a local bar. However, the members were forced to change their names, in order to avoid trouble with the law. The band went on the bill as the Del Montes, and the name stuck. A list of their tour dates and locations can be found on the band’s website.